Have you been looking for a compact hybrid that can save you money on fuel, hold a large amount of cargo with ease and still provide you with an enjoyable ride? If so, head over to Team One Toyota in Rainbow City, AL. 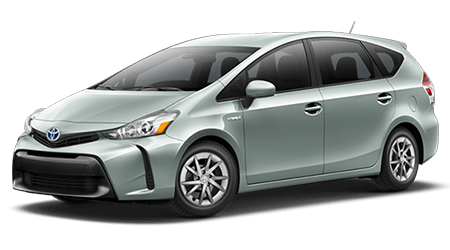 At our dealership, drivers can explore all of the latest Toyotas in stock including the 2016 Toyota Prius V. Team One Toyota has served Gadsden, Anniston, Albertville, Oxford and Jacksonville, AL for a number of years with an excellent array of Toyotas in stock. Come by Team One Toyota at 937 W Grand Ave. and discover the new Prius V today. The 2016 Toyota Prius V receives a thorough overhaul. The compact hybrid features a more aggressive look that helps the compact hybrid save more money on fuel. The hybrid benefits from a revised front-end, new LED headlights, a refreshed rear-end and fog lights. The interior of the hybrid also has been given some changes with new high-tech features for a more comfortable ride. With these additions, the new Prius V is an amazing option for drivers looking to save money on fuel. To provide you with a comfortable ride and fulfill all of your driving needs, the new Prius V is available in four different trims to choose from. With a variety of models to explore, you can get into a compact hybrid that can do it all. The base Two trim has a MSRP of $26,675 and features: automatic climate control, Smart Key System with push button start, fabric-trimmed seats, 16-inch alloy wheels, an integrated backup camera, cruise control, an Entune Audio System and more as standard. The next trim up is the Three that starts at $28,060 and includes: Smart Key System + Liftage with push button start, Entune App Suite, 4.2-inch TFT multi-information display, a 6-way adjustable driver's seat with power lumbar support, Entune Premium audio system with integrated navigation and App suite, integrated navigation, and more on top of the Two's standard features. The Four has a MSRP of $29,695 and includes: SofTex-trimmed seats, heated front seats, an 8-way power-adjustable driver's seat with power lumbar support, SofTex-trimmed steering wheel, an auto-dimming rearview mirror with HomeLink and more as standard. The top-of-the-line Five starts at $30,935 and features: single LED headlights, 17-inch alloy wheels, integrated fog lights and more on top of the Four's standard features. As a compact hybrid, the Prius V excels at saving you money on fuel. With the Prius V's fuel-efficient powertrain, you can enjoy driving the compact hybrid on a regular basis and still save money on fuel. The Prius V comes with a 1.8-L four-cylinder motor that is paired to an electric motor for a combined output of 134 hp. To help the hybrid get incredible fuel economy, the Prius V features an Electronically Controlled Continuously Variable Transmission (ECVT) that assists the hybrid in getting up to 44/40 mpg (city/hwy). With the Prius V's amazing powertrain, you can drive the compact hybrid everyday and not have to worry about filling up on fuel. To provide you the confidence to enjoy driving the Prius V on a daily basis, the compact hybrid comes with a comprehensive warranty. The Prius V is backed by a 3-yr./36,000-mile basic warranty, 5-yr./60,000-mile powertrain warranty, and 5-yr./unlimited mile corrosion warranty. In addition to these warranties, the Prius V also comes with a lengthy hybrid warranty. The Prius V also comes with a 8-yr./100,000-mile hybrid-related warranty that covers the HV battery, battery control module, hybrid control module and inverter with converter. When it comes to getting into a compact hybrid that has an incredible amount of cargo space, can save you money on fuel and is packed with all of the latest features, the 2016 Toyota Prius V is a great option. At Team One Toyota in Rainbow City, AL, drivers will get a first-class experience and our best price on a new Toyota. Visit Team One Toyota at 937 W Grand Ave. and test drive the Prius V today.